Gateway Pundit reporter Lucian Wintrich was arrested during his speech at the University of Connecticut this evening after he attempted to recover his notes, which had been stolen by a left-wing activist who stormed the stage. Video footage from the event shows the activist grabbing the notes and walking away, after which Lucian Wintrich can be seen pursuing the activist, physically grabbing her, and recovering them. Connecticut state law permits the use of “reasonable physical force” to recover stolen property. Nevertheless, it was Wintrich who ended up being arrested at the event. Wintrich’s speech was titled “It’s OK To Be White,” a nod to the viral, largely anonymous grassroots campaign aimed at exposing left-wing racism on university campuses. The speech was met with disruptive protests from left-wingers on campus, who chanted “Go home Nazi” at Wintrich, who is openly gay and of Polish and Jewish ancestry. 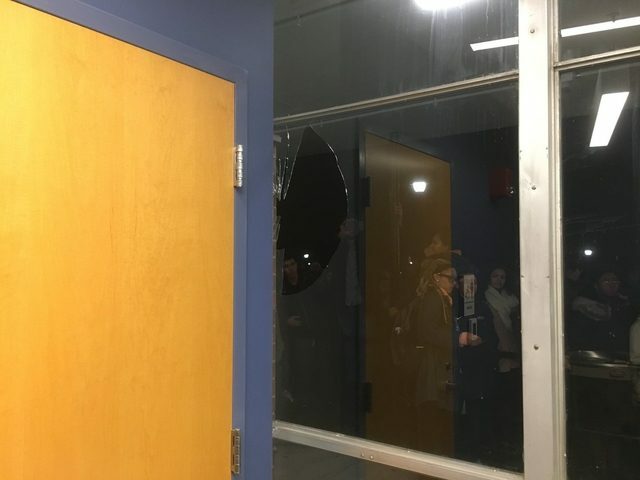 According to pictures from campus reporter Rebecca Lurye, windows at Wintrich’s event were also smashed. It is not currently known if any of the vandals have been arrested. According to Lurye, police had to ask protesters to disperse so that Wintrich could be escorted out of the event. Protesters then pursued Wintrich and the police out of the building, chasing the police vehicle as it left campus.